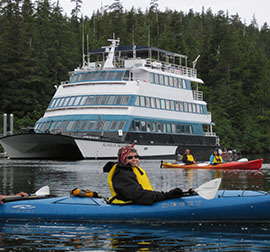 Alaskan Dream Cruises offers small ship cruising that gets passengers close to wildlife and nature of Alaska. They employ an all American crew that are predominantly from Alaska. Allen Marine is the parent company of Alaskan Dream Cruises and three generations of the Allen family have created truly Alaskan cruising experience. They own and operate five vessels that carry between 10 and 74 passengers. Their clientele are mostly over the age of 60, both singles and couples. Job opportunities with Alaskan Dream Cruises include Baker, Bartender, Chef, Culture Heritage Guide, Galley, Hotel Manager, Naturalist, Sous Chef, Steward, as well as Deck and Technical Department positions (Captain, Chief Mate, 2nd Mate, Chief Engineer, Licenced Deckhand, and Deckhand). Read the job descriptions on their employment pages and click on the “Click Here to Apply” link for an online application for employment.